Please join us on September 14th and 15th, 2019 for the Nautica Malibu Triathlon presented by Bank of America Merrill Lynch! Registration is now open! The Nautica Malibu Triathlon offers an Olympic Distance on Saturday, September 14th which features a 1.5K Swim, 40K Bike and 10k Run. The NEW Malibu Long Course will also be held on Saturday, September 14th which features a 1.2-Mile Swim, 56-Mile Bike and 13.1-Mile Run. The Nautica Malibu Triathlon benefits Children’s Hospital Los Angeles. Children’s Hospital Los Angeles mission is to make a world of difference in the lives of children, adolescents, and their families by integrating medical care, education and research to provide the highest quality care and service to our diverse community. For more information on CHLA visit www.chla.org. Are you a triathlete, athlete, fitness enthusiast or someone just up for adventure? 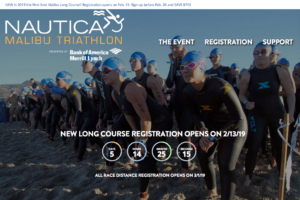 Try out the 2019 Hermosa Beach Triathlon on Sunday, June 23rd! This is an event you don’t want to miss! The event features a 1/4-Mile ocean swim in the Pacific, 10-mile bike along the coast and a 3-mile run along the shores of Hermosa Beach. Push your limits, register for the Hermosa Beach Triathlon and expand your boundaries! You can do it! The Jewish Federation’s Tour de Summer Camps is a community cycling event on Sunday, October 27th 2019 that will raise significant funds to send more of our kids to Jewish summer camp, helping them build a lifelong connection to Jewish identity and values. Cyclists and adventurers of all kinds (from beginner to expert level) will take on the challenge of a 18-mile, 36-mile, 62-mile (Metric Century), or 100-mile (Century) ride and ask friends, family, and coworkers to sponsor them in their fundraising efforts! Participants can also Cycle at Camp on one of our stationary bikes for a one hour session at 9:30 am, 10:30 am, or 11:30 am.